STURTEVANT, Wis. (WLS) -- Police deal with drunk drivers all the time. But this is a case with a twist. Officers in Racine County, Wisconsin, say they arrested a 25-year-old driver Saturday in Sturtevant driving westbound on Durand Ave, swerving into oncoming lanes of traffic. Later that night, police say, 15 minutes after the driver was released from jail into the care of a sober driver, he got another DUI violation. 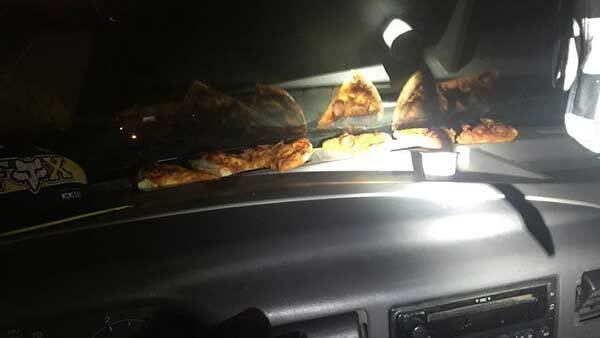 Police say they found him inside his car warming up a pizza on the dashboard. The pizza was situated over the heat vents. Police tested him and say he failed an alcohol test. So they re-arrested him - probably before he had a chance to eat that pizza. Police say the man already had one DUI on his record - these are his second and third arrests.